This 24th article in the series of “Do It Yourself: Electronics”, does level inversion of a given input using IC 555. By now, Pugs had tried two of the three operating modes of 555 – astable and monostable. How do you think, one can stop Pugs from trying the third one? So, here is his experiment to try the bistable mode, i.e. in which both high & low outputs are stable, meaning the circuit remains in the state it is in, unless triggered externally to go otherwise. A typical usage of this could be a NOT gate kind of level inversion by simply tying the input to both the trigger pin 2 and threshold pin 6. 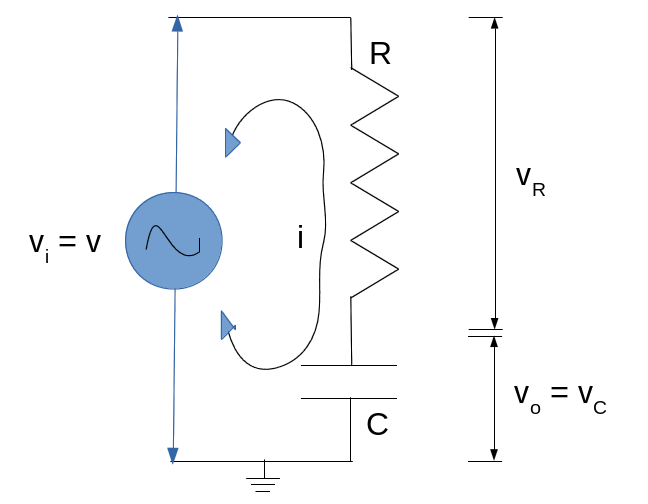 This configuration is also referred as inverting Schmitt Trigger, and very useful in boosting fainting digital signals (though inverted) and removing noise. Putting two of such would make it non-inverting. But how does it boost or remove noise? Let’s assume Vcc = 5V. 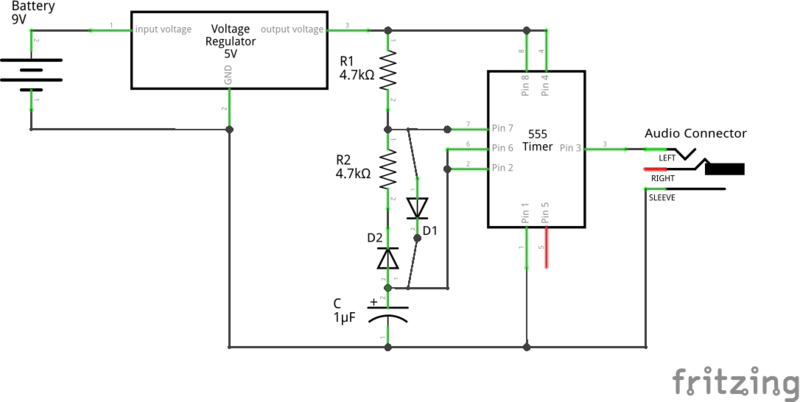 Say logic 1 (5V) signal is fainting to 4V. As it is still above 2/3 of Vcc (3.33V), the above circuitry will hit the threshold and output would be 0V (boosted logic 0). Similarly, if logic 0 (0V) is fainitng to 1V, still less than 1/3 of Vcc (1.67V), it would hit the trigger and output would be 5V (boosted logic 1). And in both cases, the output can be fed into another such circuitry to get the input boosted without inversion. The following video clip shows the immediate output level inversion. Specifically, observe that LED is off (low output) on switch released (i.e. high input) and LED is on (high output) on switch pressed (i.e. low input). In both the above circuits, pressing switch SH will take the Vo output high, and pressing the switch SL will take the Vo output low. The only difference being as how is the Vo output brought low – in the first one using the trigger pin 6 and in the second one using the reset pin 4. This entry was posted in Electronics and tagged 555 circuit, 555 timer IC circuit, basic electronics, basic electronics tutorial, bistable mode, fundamentals of 555, fundamentals of 555 timer IC, inverted schmitt trigger, level inverter, output level inverter, schmitt trigger on January 1, 2017 by Anil Kumar Pugalia. This 23rd article in the series of “Do It Yourself: Electronics”, generates a desired width pulse using IC 555. Astable – Both high & low outputs are unstable and keeps on oscillating to the other, i.e. high to low and low to high. So, also called oscillator. Examples include all the square wave generation, experimented till now, in the previous articles. Monostable – Exactly one (mono) of the outputs either high or low is a stable state. However, on an external trigger, it temporarily goes to the other unstable state, stays there for a predefined time and comes back to the stable state, on its own. This is what Pugs is planning to explore further by using a switch for the trigger. 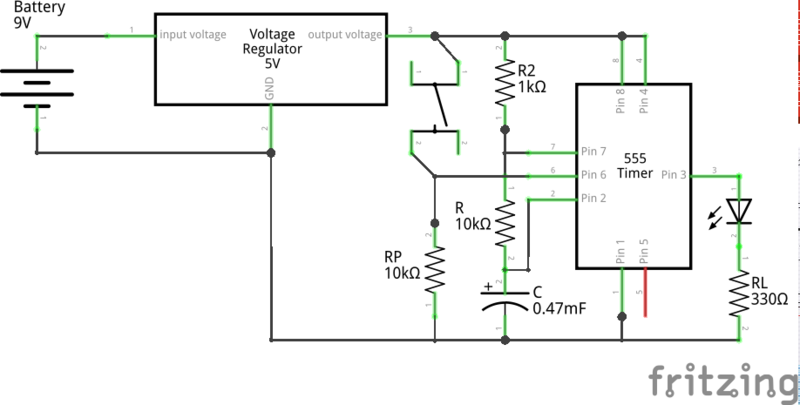 The pulse width of the unstable state is decided by the resistor and capacitor in the circuit. As it generates single (mono) pulse on trigger, it is also called monoshot configuration. Bistable – Both high & low outputs are stable, meaning the circuit remains in the state it is in, unless triggered externally to go otherwise. A typical usage of this could be a NOT gate kind of level inversion. Pugs plans to explore this in his next experimentation. Now interestingly, the mono stability could be either in the low output or the high output. Correspondingly, the pulse would be high or low, and the trigger accordingly would be low or high. And for each of these the circuits are slightly different, especially from the perspective as to where the trigger is applied. Recall that voltage below 1/3 of Vcc on trigger pin 2 triggers output Vo pin 3 to high and voltage above 2/3 of Vcc on threshold pin 6 brings back output Vo pin 3 to low. One may derive this, using the methodology similar to the one used in this previous article. So, it is left to the reader to derive the same. Pugs tried the first (monostable at low output) experiment using two set of values: (1) R = 10KΩ, C = 100μF, (2) R = 10KΩ, C = 470μF. Using (6), the corresponding pulse widths are expected to be approximately 1 and 5 seconds. And then he tried the second (monostable at high output) experiment using R = 10KΩ, C = 470μF. Using (6), the expected pulse width is approximately 5 seconds. As in previous articles, Pugs tried observing the Vo output waveforms on the home-made PC oscilloscope, as created in his previous PC Oscilloscope article. But he observed nothing other than noise, except some change when he presses the switch. This reminded him that the home-made PC oscilloscope filters out low frequency (DC) voltages, and with such low frequency Vo, there would be nothing left to observe after filtering, except when there is some change on switch press. So, Pugs decided to rather use a multimeter. But, then got the idea of putting an LED instead, which is what is visible in the above circuitries. Observe the closeness of the pulse width timing (with a watch) from the above videos compared with the expected values. That’s weird – the pulse width also has reduced. But why is that? Possibly, because the capacitor is not charged back to the full, before the switch press and so it got discharged faster. That brings to the point, that derivation of equation 6 assumes that the capacitor is completely discharged in the first case (monostable low) and completely charged in the second case (monostable high), before the trigger. If not, the calculations would vary. Now, in the first case the capacitor gets immediately discharged as it is directly grounded through discharge pin 7. So, such scenario wouldn’t happen with that. However, in second case the charging is through resistors R & R1, so that would take its own time based on the RC value, which in the above case is 5+ seconds ((10 + 1)K * 470u). To avoid this, Pugs possibly would have to by-pass the big R in the charging cycle by putting a diode in parallel with R. If you believe it, go ahead and try it out. Note: R1 has been taken small compared to R, exactly for reducing the RC effect. However, it cannot be made zero, as that would short the Vcc & GND (from discharge pin 7) when the low pulse is getting output on Vo. This entry was posted in Electronics and tagged 555 circuit, 555 timer IC circuit, basic electronics, basic electronics tutorial, fundamentals of 555, fundamentals of 555 timer IC, monoshot mode, monostable mode, pulse generation, pulse generation using 555 on December 1, 2016 by Anil Kumar Pugalia. This 22nd article in the series of “Do It Yourself: Electronics”, finally generates a 50% duty cycle waveform using IC 555. After failing to achieve 50% duty cycle square wave, or so called symmetric square wave, using his trivial circuitry, Pugs further explored. One clear observation was that the output pin 3 is the only pin which goes both high and low, correspondingly during the charging and discharging cycle. So, not using pin 3 means that there has to be two separate paths for charging and discharging the capacitor C, meaning two separate resistors R1 & R2 similar to the initial design as in the first 555 article. And if we put R1 = R2, we get a 50% duty cycle. From the above waveform, we approximately have t_on = 3.2ms and t_off = 3.0ms. Close enough to our expected value of 2.98ms (as per equation 4 or 5), but not really satisfactory as t_on and t_off are still not exactly same, even though R1 and R2 are closely equal. And, now we see that t_on and t_off both are approximately equal to 3.2ms. To be more exact, one may use a pot in place of R2 & D2, and then adjust it to match it with resistance of R1 & D1 – more precisely by matching the off cycle to the on cycle. This entry was posted in Electronics and tagged 555 circuit, 555 timer IC circuit, basic electronics, basic electronics tutorial, fundamentals of 555, fundamentals of 555 timer IC, square wave using 555, square wave using 555 timer IC, symmetric square wave using 555, symmetric square wave using 555 timer IC on November 4, 2016 by Anil Kumar Pugalia. This 21st article in the series of “Do It Yourself: Electronics”, tries generating a 50% duty cycle waveform using a non-conventional trivial circuit using IC 555.
thus giving a 50% duty cycle. WARNING: Do NOT put the pot to a value of zero, as that will overload the circuit. A safety workaround could be to put a fixed 1K resistor in series with the pot. Then, for C as a 1μF capacitor, he adjusted R to different values to get different frequencies with 50% duty cycle. But, what’s this, none of them have a 50% duty cycle. t_offs are pretty exact, but t_ons are really high. After quite a bit of analysis, Pugs realized that the peak Vo is not actually reaching Vcc. Debugging trick he used, was to replace the 1μF capacitor by a 100μF capacitor, thus reducing the frequency in Hz (eye observable), and then measuring the Vo using a multimeter. Aha! if the Vo doesn’t reach Vcc, then in the above circuit, we are not charging the capacitor using Vcc but this measured peak value of Vo. Mathematically, this changes our derivation for equation (1) in the previous article, though equation (2) remains the same. And hence, getting a correct t_off but incorrect t_on. Even conceptually, we can see that as Vo is less than Vcc, the capacitor would take more time to charge, and thus increasing the time (t_on), as observed in all the readings above. Putting in the values, gave t_on values amazingly close to the observed values, thus again verifying the theory. Also from the 555 IC datasheet, Pugs found that there is always some expected drop on the peak Vo from the supply voltage Vcc, and the peak Vo in most cases would be less than Vcc – thus rendering all our standard calculations of t_on futile. In fact, if we put the actual value of peak Vo in our calculations, we would get the results as observed. But getting the actual value of Vo is non-trivial and non-standard. Moreover, even if we do that somehow, we are not going to get our desired 50% duty cycle. Thus, moral of the story is that, in general, Vo should not be used to generate the trigger voltages, as practically it may not be reaching Vcc, as in the case above. And, Pugs would have to find out some other way to achieve 50% duty cycle. This entry was posted in Electronics and tagged 555 circuit, 555 timer IC circuit, basic electronics, basic electronics tutorial, fundamentals of 555, fundamentals of 555 timer IC, square wave using 555, square wave using 555 timer IC on October 1, 2016 by Anil Kumar Pugalia. This 19th article in the series of “Do It Yourself: Electronics”, decodes the working of an RC circuit. After the derivation of the formulae, slide 8 above shows their usage. It predicts the change in sine wave amplitude & phase angle at 2 different frequencies of 1KHz & 2KHz compared to the input, for various pairs of R & C values. 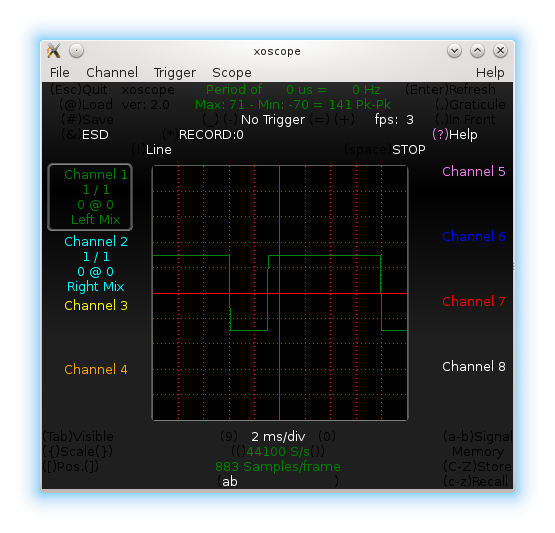 And, then Pugs verifies them (within tolerance limits) by comparing the input and output waveforms, on the home-made PC oscilloscope, as created in his previous PC Oscilloscope article. Note that, while measuring, the GND is kept common for the two waveforms. Also, Pugs used the two stereo lines of the audio jack for the two waveforms, and configured xoscope accordingly. Continuing from the previous formulae derivations, the final slide 9 shows the high-pass & low-pass filter computations and the calculation of the cut-off frequency, which has been used in the previous article. This entry was posted in Electronics and tagged basic electronics, basic electronics tutorial, basic filter computations, basic filter design, basic RC filter, high pass filter, HPF, low pass filter, LPF, RC analysis, RC computations on August 1, 2016 by Anil Kumar Pugalia. 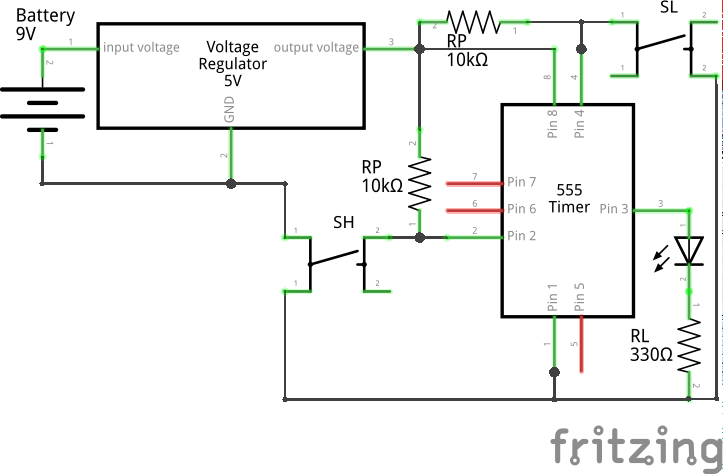 This 18th article in the series of “Do It Yourself: Electronics”, demonstrates basic resistor-capacitor (RC) based filter design. Though Pugs got the various waveforms generated, on closer look he realized that there were steps in the waveforms like sine, triangular, …. Expected right? Because of the approximation. Also, the PWM carrier frequency was present. So, would it produce the results as expected in an resistor-capacitor (RC) experiment with a single frequency sine wave? That was a big question. Or rather, can the unwanted frequencies be eliminated? That brought Pugs to the exploration of filters. Let’s see what Pugs learnt about them. Current i through a capacitor of C farads is given by C dv/dt. And if the voltage is DC that is constant, dv/dt is zero and hence i is zero. So it is said, DC is blocked by a capacitor. If the voltage is AC that is sine wave of a particular frequency, dv/dt would become a cosine wave, or sine wave with 90° phase shift but with same frequency. Along with, C becomes the multiplication factor to give C dv/dt as the non-zero current i, hence AC is allowed to pass through a capacitor. 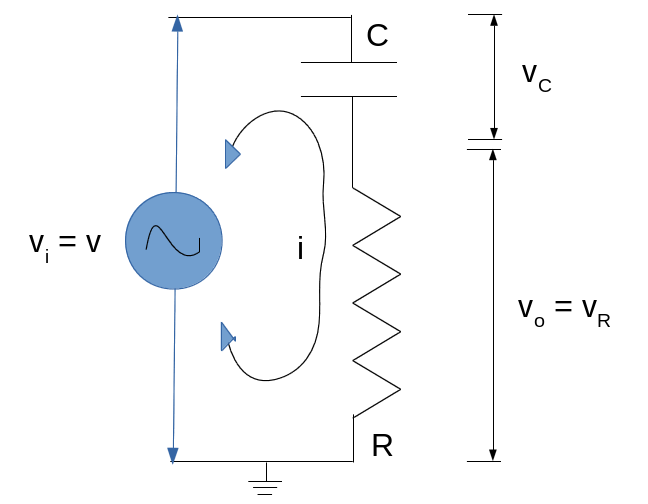 Current i through a resistor of R ohms is given by v / R. So, AC or DC both currents are allowed through it without any phase shift, just with the multiplication factor of 1 / R.
Now in the amplification formula, observe that the minimum amplification is zero at zero frequency i.e. at DC, and keeps on increasing with frequency, reaching one, at infinite frequency. But practically, one can’t reach infinity. Hence, for practical purposes, the amplification is considered good enough at a value of 1/√2, which happens when ω * R * C = 1, meaning at frequency = 1/(2 * π * R * C}, which is often referred as the cut-off frequency. And for practical purposes, the currents of frequencies below this are cut-off, only allowing the ones above it. Note that, by controlling the values of R & C, one can beautifully control the cut-off frequency. 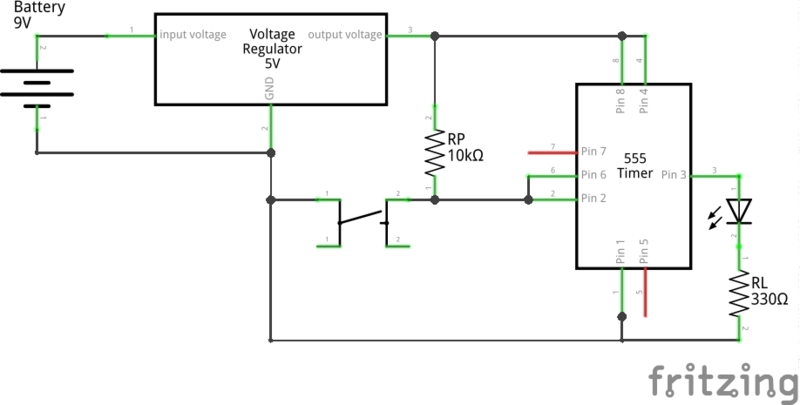 Now, this current passing through the resistor R gives the voltage vR across the resistor as R * i. Thus, this voltage also follows the same cut-off. So, if one considers the voltage v as input and the voltage vR as output, that gives a high pass filter (HPF), which passes the frequencies above the cut-off and (practically) blocks the ones below it. With this, Pugs have got the two simplest RC filters. Now, for proper sine wave, most importantly Pugs wanted to remove the PWM carrier frequency, which is way higher than his various waveform frequencies of 1 & 2 KHz. So, Pugs would need a low pass filter, which passes 1KHz, 2KHz but filters out the high PWM carrier frequency. A 5KHz cut-off frequency for the filter seems okay. So, let’s compute the values of R & C for it. As per the formula, R * C = 1/(2* π * frequency) = 1/(2* π * 5000) = 31.831 * 10-6s. Assuming a value of 1K ohms for R, C could be chosen as the standard 33 nano farads. Using these two selections, Pugs computed back the cut-off frequency, which turned out to be 4.8KHz – that’s fine for Pugs. Taking a 1K resistor and a 33 nF capacitor, Pugs connected them in series across his sine wave output. Pugs then checked the output between RC joint and GND, on the home-made PC oscilloscope, as created in his previous PC Oscilloscope article. It showed up the sine wave as in his previous article but now with almost no carrier frequency zigzags, though the amplitude was a bit reduced. 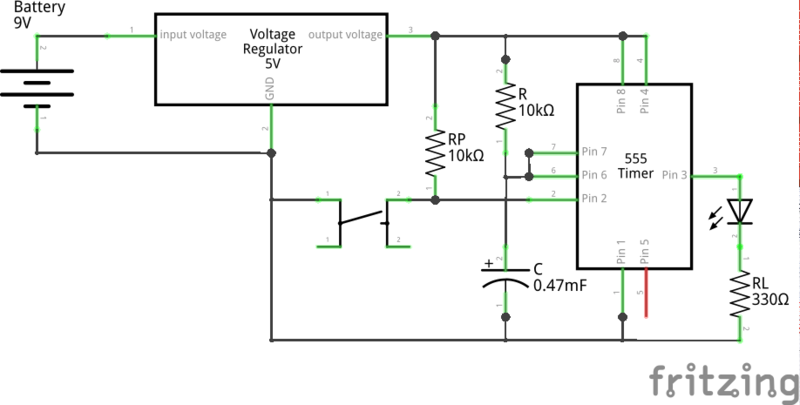 This entry was posted in Electronics and tagged basic electronics, basic electronics tutorial, basic filter application, basic filter design, basic RC filter, high pass filter, HPF, low pass filter, LPF, RC analysis on July 1, 2016 by Anil Kumar Pugalia. This 16th article in the series of “Do It Yourself: Electronics”, demonstrates generating sine wave using the AVR micro-controller ATmega16. Pugs have been thinking of trying some resistor-capacitor (RC) based experiments in his room, the way he has done in his electronics lab. But for that he needed to have some sort of sine wave signal generator. 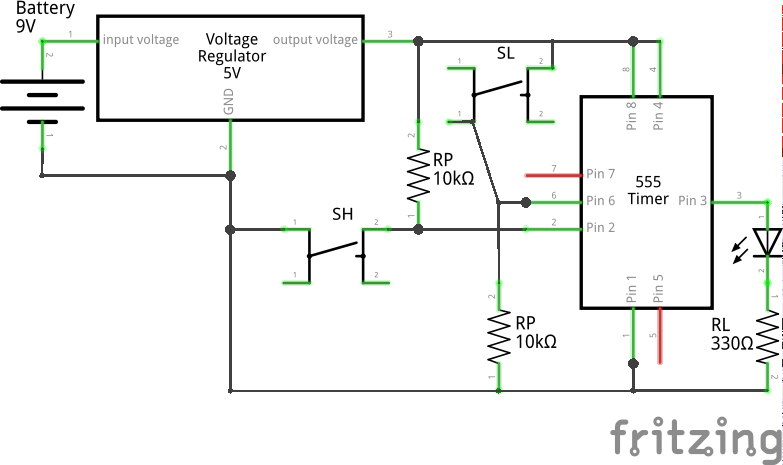 As usual of Pugs, rather than buying a function (wave) generator, he thought of starting with creating a simple sine wave generator of his own, say at a fixed frequency of 1KHz, using his micro-controller ATmega16. For that Pugs needed some sort of analog output generator. And, interestingly he remembered already creating a PWM-based digital to analog conversion (DAC) approximation with Rohit, in one of his previous articles. There they have generated the analog output voltage on OC0/PB3 using Timer0. However, as always, Pugs is looking for learning things he has not yet tried. So, this time, he thought of doing the analog voltage generation on OC2/PD7 using Timer2. 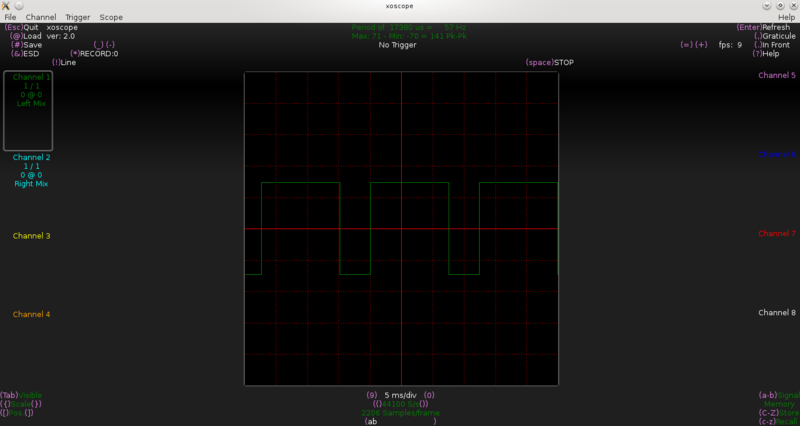 On deeper thought, it clicked to Pugs that for a sine wave one needs different analog outputs but in a periodic fashion. And to get a perfect periodicity, it would possibly need one more timer, say Timer0. “So, this time why not try interrupt-based timer for the periodicity. I would also get a chance to write a interrupt handler”, flashed the thought through Pugs’ mind. Obviously, Pugs referred to the ATmega16 datasheet pg 71-86 & pg 117-134. But the earlier articles on DAC and Music Generation using micro-controller were quick starters. Now, why is the Timer0 period set to 50us, meaning it will trigger every 50us. Let’s understand that by computing the sine wave. To generate a sine wave, one needs to output various analog voltages – theoretically speaking infinite different values between -1 to +1 multiplied by the amplitude. But practically, in our case we can make it only finite, say 20 different values. So after these 20 different values, we would repeat them, thus generating a periodic approximate sine wave. And to achieve a 1KHz sine wave, or in other words sine wave with a period of 1 / 1KHz = 1ms, we would need to output these 20 values spread over this 1ms, meaning outputting 1 value every 1ms / 20 = 50us. And, setting the Timer0 to 50us, now means outputting 1 value every time the Timer0 handler is triggered. With this, we could have the maximum sine amplitude of 127 units in terms of OCR2. So, we shall take some default, say 10, and control it by multiplying it with the AMP_FACTOR macro defined above. This allows us to have a maximum amplification factor of 12 for an amplification of 12 * 10 = 120 (< 127). Currently, just defined it to some intermediate value of 5. All boundaries set, but what about the actual 20 values we need. For that, we have to use the sine function at intervals of 360° / 20 = 18°, i.e. / 10 – the values being 0, 0.3, 0.6, 0.8, 0.9, 1.0, 0.9, 0.8, 0.6, 0.3, 0, -0.3, -0.6, -0.8, -0.9, -1.0, -0.9, -0.8, -0.6, -0.3. Multiplying by 10 (our default amplitude), we get 0, 3, 6, 8, 9, 10, 9, 8, 6, 3, 0, -3, -6, -8, -9, -10, -9, -8, -6, -3. Hence, finally we need to set the corresponding value, centred with 127, to OCR2 on every Timer2 interrupt trigger. Here’s the final sine_wave.c coded with an empty “while 1” in main(), as all logic is handled in the interrupt handler specified by ISR(). Pugs then checked the DC & AC voltages between PD7 and GND pins of the micro-controller, after removing the short of jumper J1. They showed up as approximately 2.5V (average) and 0.7V (root-mean-square (RMS)), respectively. 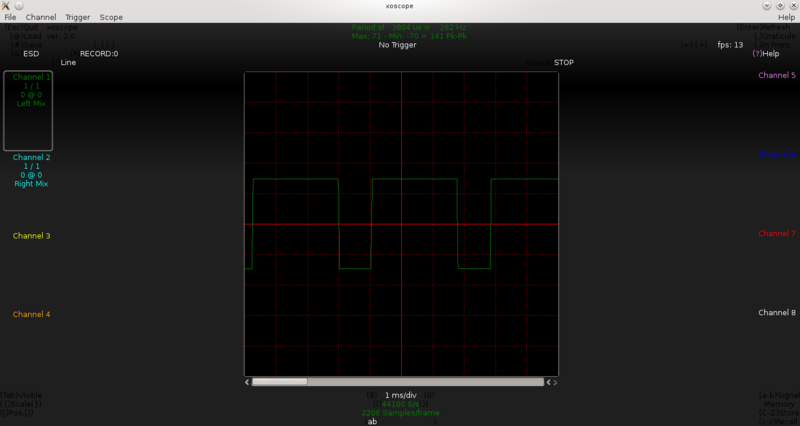 And it was a visual treat to view the sine wave on the home-made PC oscilloscope, as created in his previous PC Oscilloscope article. This entry was posted in Electronics and tagged ATmega16 based sine wave function generator, ATmega16 based sine wave generator, ATmega16 interrupt, ATmega16 interrupt handler, basic electronics, basic electronics tutorial, DAC using PWM, digital to analog conversion using pulse width modulation, Interrupt based Timer, Interrupt based Timer on ATmega16, Interrupt based Timer on micro-controller, Interrupt based Timer on uC, micro-controller based sine wave function generator, micro-controller based sine wave generator, sine wave function generator, sine wave generator, uC based sine wave function generator, uC based sine wave generator, uC interrupt, uC interrupt handler on May 1, 2016 by Anil Kumar Pugalia. This 15th article in the series of “Do It Yourself: Electronics”, demonstrates accessing the real time clock (RTC) chip DS1307 over the I2C protocol using the AVR micro-controller ATmega16. Equipped with I2C implementation for AVR’s ATmega16 (in the previous article), it was time to connect an I2C device to try out the protocol. Pugs decided to use the RTC chip DS1307, and then read & write the real time from it. While going through DS1307 datasheet to put it on the breadboard to connect with ATmega16, Pugs realized that he would need a 32768Hz crystal, apart from powering the RTC chip. So while purchasing the DS1307 chip, he also got the crystal. And from the DS1307 datasheet pg 7, Pugs figured out that it is the chip’s first 7 registers (for second, minute, hour, day, date, month, year in binary coded decimal (BCD) format), which need to be read or written for reading or writing the real time from the chip. Also, that the RTC operates only in standard I2C mode (pg 10) and the 7-bit slave address of the RTC is 0b1101000 (pg 12). And accordingly, he prototyped the RTC logic in rtc.h and programmed them in rtc.c. With all code set to read and write the RTC, Pugs needed some application code to call these. 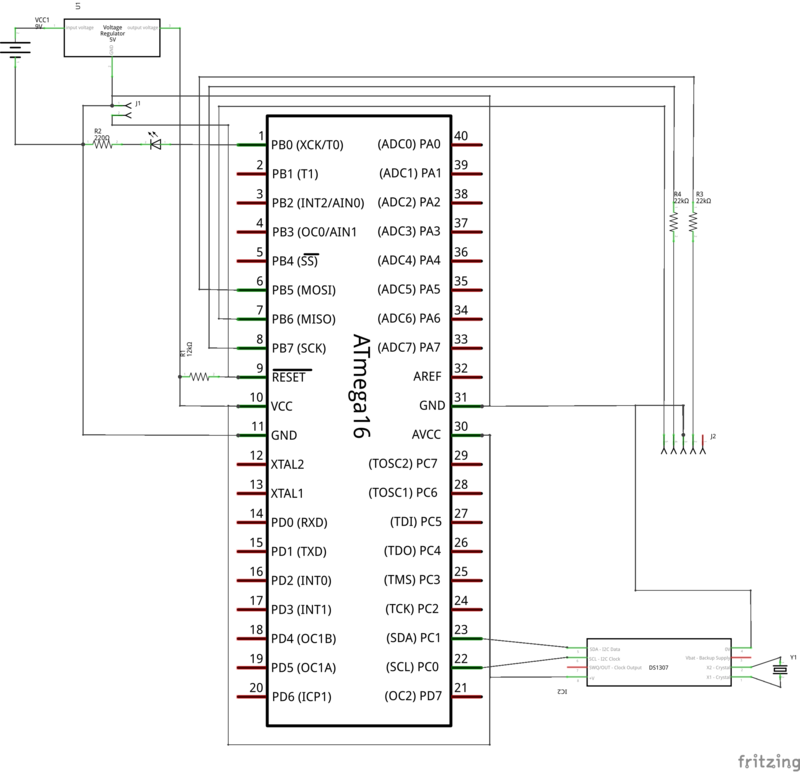 That’s where he implemented the following rtc_serial.c to operate on the RTC using serial interface. Yes, the same serial interface, he had setup in the previous articles, using the TTL to USB converter. Note the usage of serial APIs implemented in the previous USART article, and used in the previous debugging article, with modified serial.c. Note that Pugs’ TTL to USB connector shows up as /dev/ttyUSB1 on his laptop. In case, yours is different, use that instead. But what’s this, even after removing the jumper J1, no output on the minicom – seems like it is stuck. Aha! suddenly, it clicked to Pugs that he has missed something important, which was decided during the TWI implementation (in the previous article). Yes, the fuse settings of the ATmega16 to be changed for it to operate at 8MHz. So, that’s what exactly he did next. And yes, this time after removing the short of jumper J1, he started getting the date & time displayed every 5 seconds from 2075. And, to quit from minicom, Pugs typed Ctrl-A Q. This entry was posted in Electronics and tagged Accessing the Real Time Clock, Accessing the RTC, basic electronics, basic electronics tutorial, Real Time Clock interfacing with ATmega16, Real Time Clock interfacing with micro-controller, Real Time Clock interfacing with uC, RTC interfacing with ATmega16, RTC interfacing with micro-controller, RTC interfacing with uC on April 1, 2016 by Anil Kumar Pugalia.